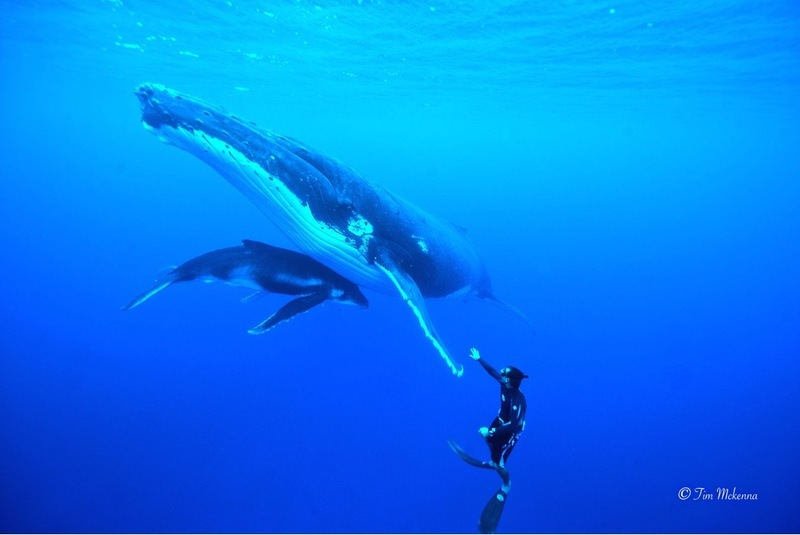 Benefit from our 24 years' experience for respectful and unforgettable encounters with humpback whales in Moorea. 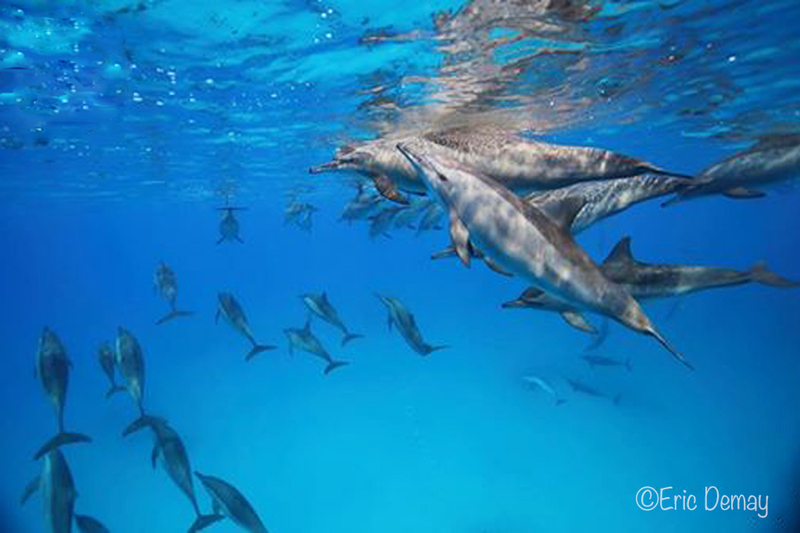 During their stay in French Polynesia, these fascinating marine mammals offer us beautiful interactions, especially with mothers and calves or with singer males. According to your preferences it's also possible to enjoy a tropical sunbath on the front deck of it's bow area. Small group only up to 12 people, friendly and attentive, our experienced team welcomes you and guides you on snorkeling swim for a unique and safe adventure. ENJOY - this oceanic expedition is a unique adventure to enjoy the beauty of ocean home, by interacting encounters with the marine wildlife found in the open ocean and the pristine lagoon, just perfect clear blue waters for viewing the sea life. HUMPBACK WHALES are marine mammals, highly migratory, undertaking every year long travels of thousands kms. They come to spend many months in polynesian clear waters during austral winter, from mid-July to mid-November, to give birth and mate, before leaving for Antarctica to feed. During their stay around polynesian islands, living on their fat reserves, their activity is punctuated by rest and social activities. They use to stay close to the island reef, thus protecting their calves from orcas, however they easily allow us to encounter them, as these gentle giants are curious of their environment and sometimes very sociable. They are known for their spectacular jumps up to 16 ft out of water, and for impressive, long, elaborate and complex songs of the males during the breeding season. Competition between males to get female favors is often intense. A female gives birth to one calf every 2 years, after about 11 months of gestation. Shortly after birth, the female can mate again. 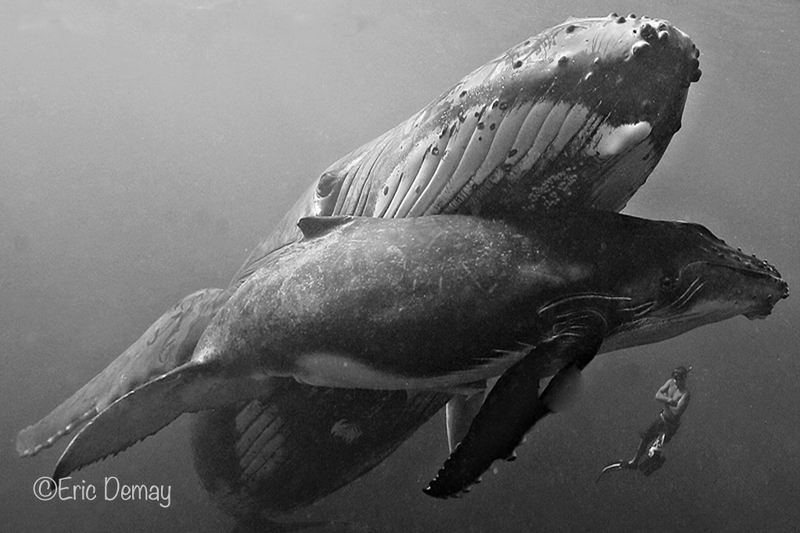 A strong love connects mother and her calf, she nurses for many months, and she is often extremely protective. ENCOUNTER - RESPECT - Therefore it is very important to apply some observation rules avoiding to stress them and to endanger the calf. During expedition trip we bring you on either watching and swimming with humpback whales, and we focus to achieve the most natural encounter and get the best from the whales on their terms. Upon "invitation" by these gentle giants, and if ocean conditions permitting, you may have opportunities to sleep into the water for a safe guided snorkeling, experiencing an up-close and unforgettable ancounter with the Queen of Oceans. During our approach we put great emphasis on patience and the utmost respect for these majestic creatures who welcome us in their natural environment. Any swim encounter is dependant on the whale behaviour. Encounter is possible only if the whale agrees it ! Our ethics and extensive expertise since 24 years guides you in the best conditions. PLEASE be attentive to the instructions of your captain and guide, which must be followed. Despite their good reputation, whales are very strong and powerful with phenomenal strength, weighing up to 45 tons. A lack of knowledge of their behavior and an unwelcome approach can disturb them a lot, even might become a danger. Every day is different but always magical ! RELAX - Back in the lagoon, surrounded by crystal blue waters, swim with graceful stingrays which lightly brush up against you, and snorkel among black-tip sharks. • Healthy local exotic fruits tasting along with beverages are complimentary served on board. • During expedition, we are happy to share with you details information about life, society and behaviour of humpback whales and other marine species. Details informations about pick up are sent during booking processing. PLEASE NOTE : we bring you for interaction with wild animals in their natural environment, an expedition program is not exhaustive, and will be tailored to the opportunities of the day. The "maraamu", a strong tropical wind, cool and dry, may be present some days, so it is recommended to bring warm clothes . Most of the expedition occurs in the open ocean, out of the lagoon. Protected areas from the wind and swell will be preferred, but whales and/or dolphins may also be in more turbulent areas. If you are suffering from seasickness, it is strongly advised to provide preventive measures : medicines, homeopathy, anti-nausea bracelets, essential oils,.....ask to your drugstore. Native of Moorea, Heifara, our captain, was one of the last deep pearl oyster divers in the Tuamotu islands, with over 3000 dives under his belt. He started interactions with marine wildlife in 1994, and was the first one to bring people into the water with humpback whales in Moorea more than 20 years ago. He has been close to the ocean since he was very young, being an avid surfer for 35 years, he also practices spearfishing and other water activities, he has captured the true spirit of the sea. His great knowledge of underwater world and understanding of animal behavior, his ease and deep connection with the ocean, have made him a renowned expert and your perfect polynesian guide for a privileged adventure, with encounters in utmost respect for wild animals in their natural habitat. Hi - I'm interested in going out on a whale swim tour with my husband and son in late Sept or Oct. Could you advise what timing is best? Also, my son is 7 - would he be allowed to come? He is an excellent swimmer as are we (both marine biologists). I'm here in Moorea with a group of 6. We are all 'whale freaks' :>). I'm staying at the Kaveka this week and met another guest named Ken (I don't know his last name). He went out with you and mentioned that you may be interested in putting together a boat to see whales in Rotorua. So I wanted to discuss this with you and talk about the possibility of doing this next year. We are heading to French Polynesia for our honeymoon and will be in Moorea from Nov. 17 - Nov. 20th. Is that too late to do the swim with the whales tour? We were really hoping to be able to do it. Please let me know if this is somehow possible. We will be on Moorea from November 7 - 9 and are interested in a boat tour with whale, dolphin, ray, shark watching / swimming. Could you please let me know what you have on offer on these days? We are from 24-30sept in moorea, when is wale watching toors? Is booking now important or is it every day and you have enuff space for 2 adult. How is it whit a baby 10 months old?